Here we detail our key ICO information, how INX tokens are distributed and the use of the funds raised. Type of token: The INX token is a payment token, it can be used as payment on the Investx platform which allows investors to invest in shares in their chosen listed businesses and receive any return payments from their investments. Token liquidity: Our model is designed to remove all reliance on external token liquidity in order for the Investx platform to function and thrive. 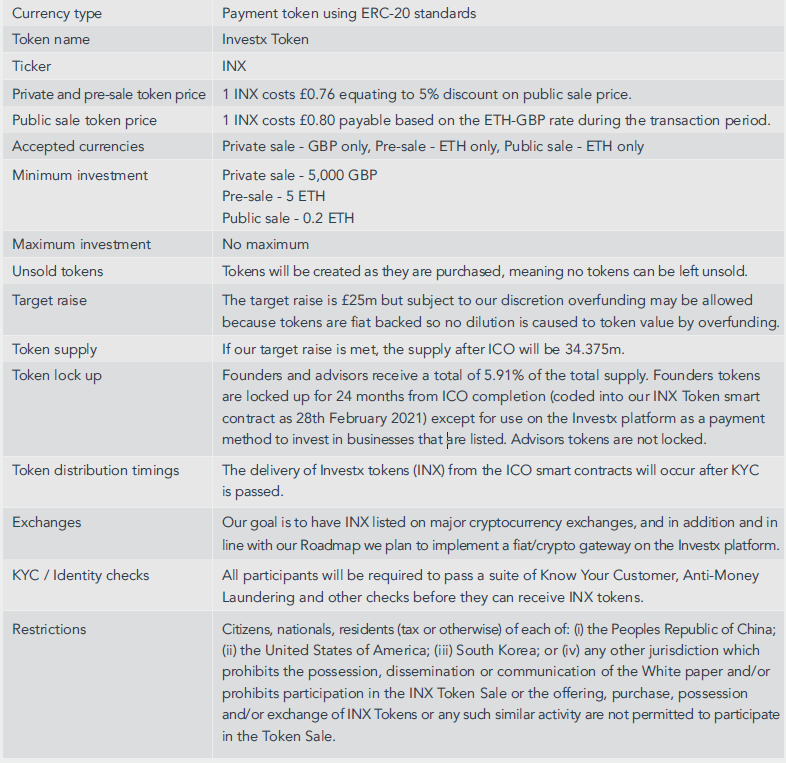 Investx’s ICO is an Ethical ICO, and the following table shows the basic information about its structure. Unlike most ICOs the vast majority (90.91%) of tokens are sold in the crowdsale. There is no company token reserve, so we cannot dump our own tokens back on the market. Market price of the INX token will be driven by platform deal flow and demand, and backed by fiat reserves. Public sale (31,250,000 INX / 90.91%): Participants must register on the Investx ICO website and pass KYC and AML checks. Bonus — Founders and Advisors (2,031,250 INX / 5.91%): Founders’ and advisors’ tokens will be minted when the ICO public sale completes. Founders’ tokens will be subject to a 2-year lock-up period (actual vesting date 28th February 2021) meaning founders can’t sell their token allocation during this period. They can, however, use their tokens as a payment method to acquire shares in businesses through the Investx platform during this period. We believe a 2 year lock up offers the right balance between providing founder/team incentivisation to grow the company and token value, and assuring investors and token holders that the founding team are in for the long-haul and not a short term gain. Advisors’ tokens will not be subject to a lockup. Bonus — Token Purchase Incentives (1,093,750 INX / 3.18%): To attract investor referrals and large investments to the ICO, we will offer a maximum of 3.18% of the supply as bonus tokens which will be provided to introducers. The bonus is calculated on an individual investment basis and subject to amount invested. Legal and compliance (5%): Financial and cryptocurrency regulatory solicitors will be engaged as external resource as well as permanent in-house resources helping to ensure full compliance with UK, EU and Worldwide regulations. Investx has already engaged CMS Cameron McKenna Nabarro Olswang LLP as global legal and regulatory advisors. Business development and marketing (13%): Business development managers will be employed in the UK and EU territories, and incentivised through commissions for direct and broker sourced deals. Marketing budgets for external specialists will be meticulously overseen to ensure strong ROI when marketing to businesses and investors. Expansion of team, staffing, general company overheads (7%): Recruitment and expansion of experienced board directors, as well additional finance and customer service employees. Investx Reserve (65%): Funds will be held in GBP in ring-fenced bank accounts (except for 15% at the target raise being held as non-cash assets) used only to pay over to crowdfunded businesses as INX tokens are spent and burnt. If more than £25m is raised then the excess will be added to the Investx Reserve account. If less than £25M is raised the reduced amount will be reflected first in the Investx Reserve account. At the soft cap no funds will be held in the Reserve account, and further tokens will be sold when the platform is live. If less than £7.5m is raised, the business plan will be re-evaluated and a decision made about the return of funds, extension of ICO period or the continuation of the business under a renewed plan. This decision will be made by the board of directors of Investx and they will have complete discretion to decide on, and take, any action in relation to the future of the business. Investx will allow overfunding above the £25m target raise to engage more investors and add further reserve backing to token value. There is no value dilution in selling more tokens. 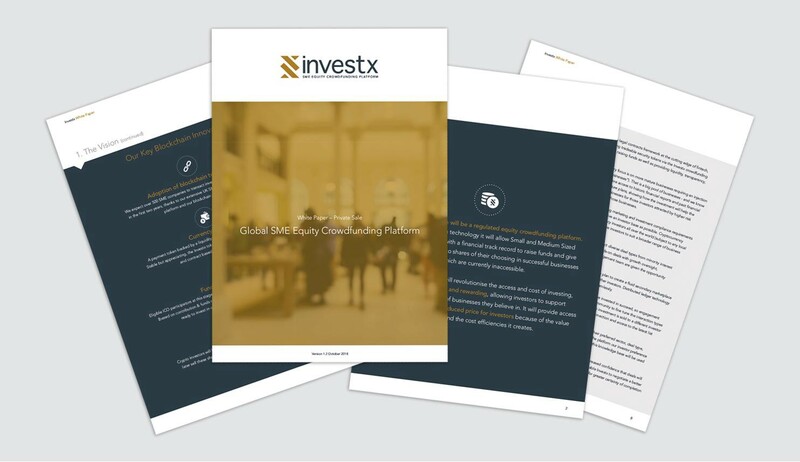 Investx is creating a crowdfunding platform to allow global retail & institutional investors to invest in unlisted businesses in a cost-efficient, transparent way. Our technology creates liquidity in an illiquid asset class and bridges traditional investment with cryptocurrency.